While contemporary interiors are ideal for modern living, there are many properties with period features that just don’t suit contemporary styles – there’s also a certain romantic nostalgia in recreating the grandeur of yesteryear. This new design series examines the key elements that defined historical interiors and gives advice on how to recreate these authentic looks with modern pieces. The late 1400s to the early 1600s in England is known as the Tudor period. During this time, trade links with the world were increasing, as was the nation’s prosperity. Rich noblemen and traders chose to show off their wealth by building grand country homes and furnishing them with the most expensive materials of the time. Heavy, carved oak furniture took centre stage in rooms that were draped with richly embroidered fabrics and adorned with oak panelling. Today, even with period features, it’s unlikely that a complete Tudor look will be desirable in the home. Instead, a smattering of the right products can create a Tudor theme without feeling as though you’ve strayed onto the set of Wolf Hall. Our designers at ani M INTERIORS have chosen some key areas where the right products will create the look. 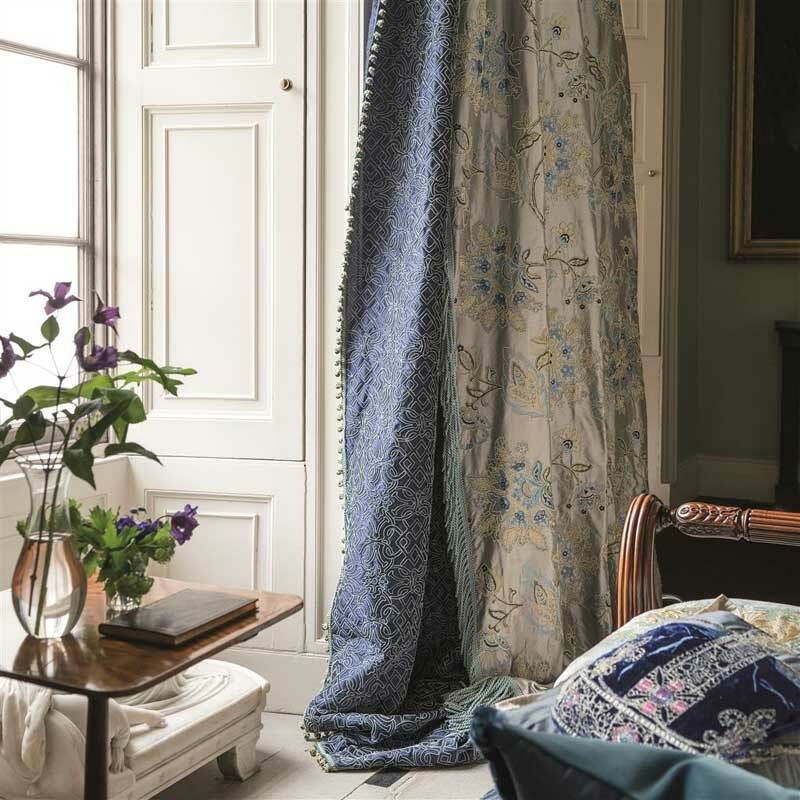 Sumptuous layers of velvet or rich brocade fabrics are the order of the day, such as these sapphire and silver silk drapes from Designer’s Guild. You don’t have to have ornate leaded casement windows to feel the instant luxury and warmth they will bring to a room. Fabrics were celebrated by the Tudors and the richer they were, the better. Velvet cushions, throws and seat coverings softened the hard oak and stonework of Tudor interiors and showed the owner’s wealth. 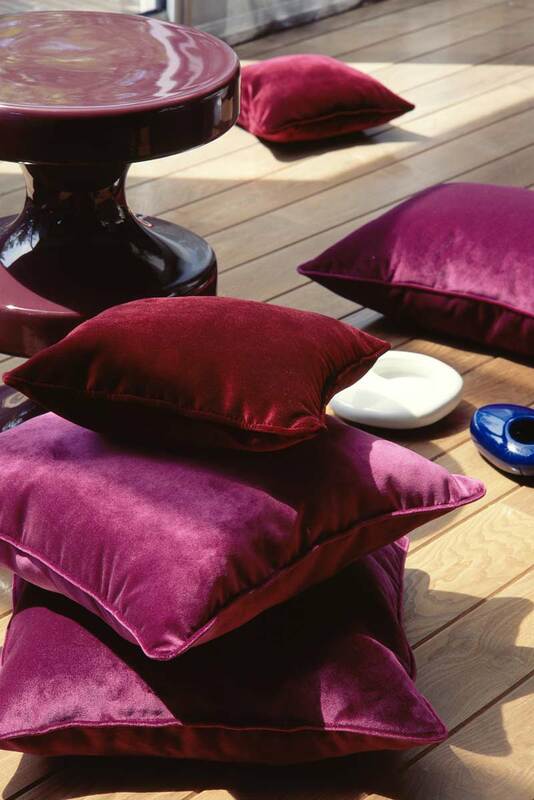 These plush, plum cushions from Lelievre are irresistible. Bare boards and York Stone floors were as popular in Tudor times as they are today. They look effortlessly stylish and showcase rugs in spectacular fashion. 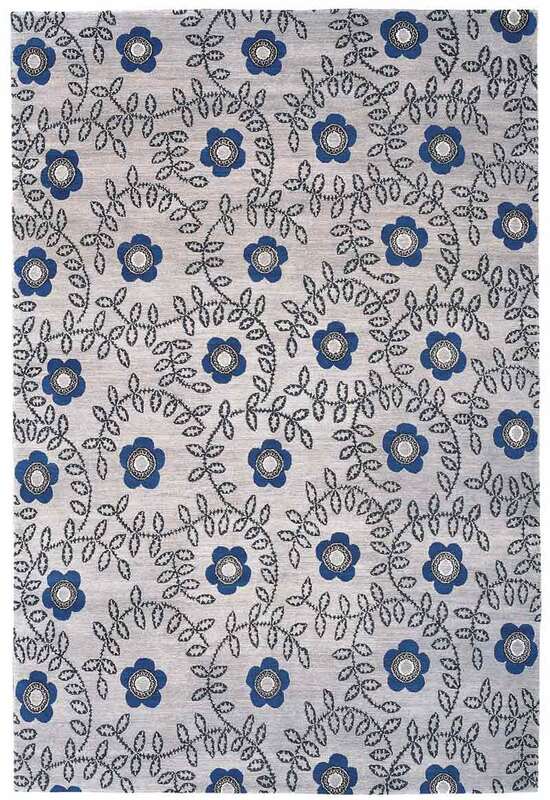 This made to order Tudor Rose rug from The Rug Company will bring a contemporary twist to a Tudor-inspired scheme. The Tudors were very keen on decorative motifs such as roses, thistles and fleur de lys as well as coats of arms to show their status. 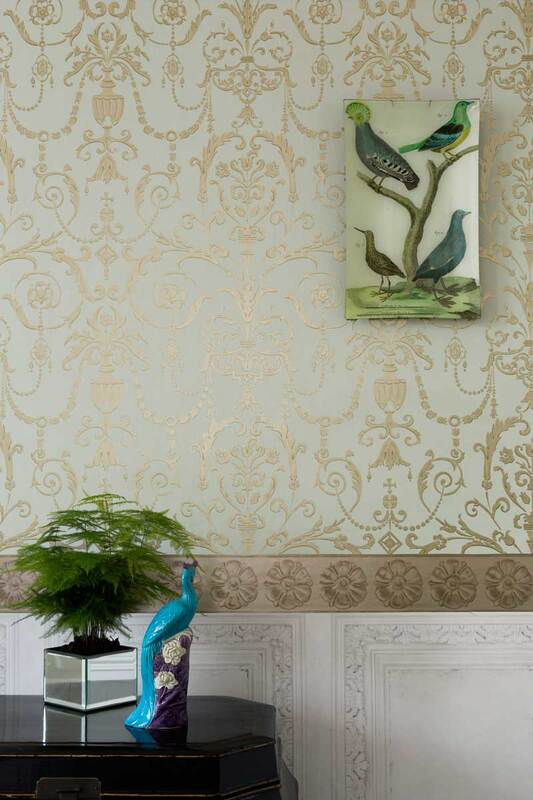 A great modern take is this Royal Palace collection of wallpaper from Cole & Son, not only does it mimic the regal patterns that were popular but it also comes in metallic shades. What could be grander? Unless you already have oak panelled room, this isn’t a practical look to try to recreate. 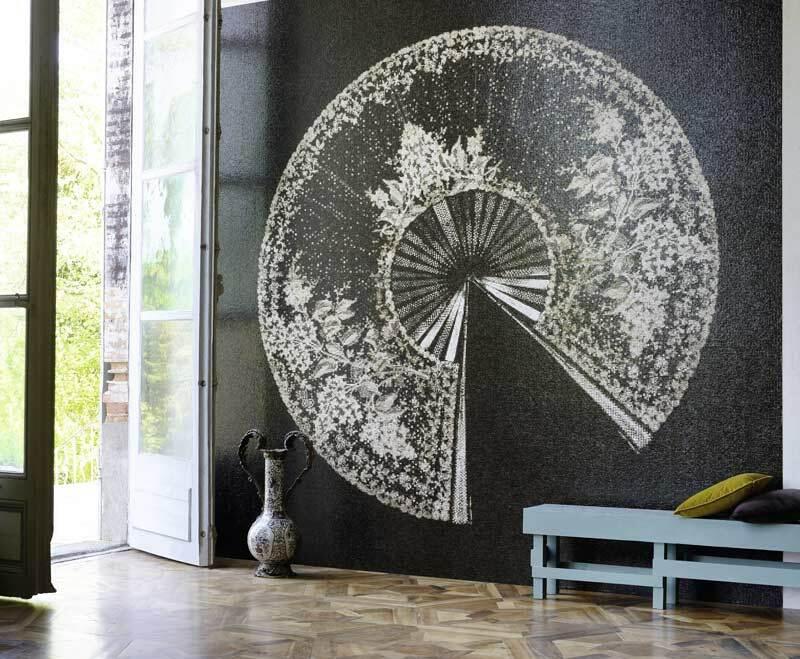 Instead, try a wall covering with bold geometric patterns or simple shapes such as this paper from Elitis. It isn’t overtly Tudor in style but it does make a feature of the wall. Today’s interior design will place a beautiful or striking painting in the heart of a scheme. For the Tudors however, this work of art would have been a tapestry depicting court life or battle scenes in stunning detail. Unless cross stitch is your hobby, a tapestry of this kind is unlikely to adorn your walls. 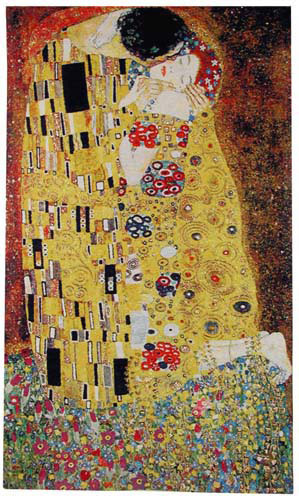 Instead try something a little more contemporary, fall in love with Klimt’s The Kiss, available from Tapestry Art. Heavy oak furniture such as four-poster beds or heaving bedding chests, while beautiful, may not suit your home nor be practical. Instead keep it simple with delicately carved pieces such as chairs and smaller tables. This Chandra chair By Koket is a great example, small, sophisticated and upholstered in velvet – its Tudor indulgence for the 21st century. Tudor décor is defined by a use of rich materials and high drama. It’s easy to bring this same flare to your interior without it looking out of place in a modern home by paying attention to the key areas. If you would like the team’s advice on how to bring the Tudor theme to your home, get in touch today.